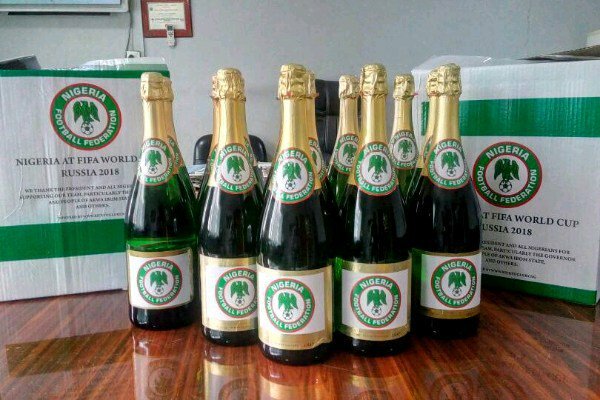 The Nigeria Football Federation (NFF) has produced customized champagne bottles, in anticipation of the Super Eagles’ victory over Zambia, in a 2018 World Cup qualifier on Saturday. Nigeria need all three points, to guarantee a spot at next year’s tournament in Russia. Should that happen, the NFF will throw up a luxury bash with special bottles of wine. The images of the champagne leaked online on Friday. Media Officer of the Eagles, Toyin Ibitoye, however denied knowledge of the luxury celebration in store. “We don’t know anything about champagne, all we know is training and getting the ticket to Russia,” he said.